Conditions at Kahana on Sunday were even more north than on Saturday. At some times during the day it was a bit west of north. But a certain trio of die hard individuals refused to believe that it was too north to fly there, and somehow we made it happen. But not before a lot of kiting all around north launch, repeatedly launching, scratching, sinking, and top landing, until we got a lucky cycle to climb up and out and around the corner. I was glad to discover I can still do that! Steve charged out there first, and I followed soon after, with Drew a distant third. 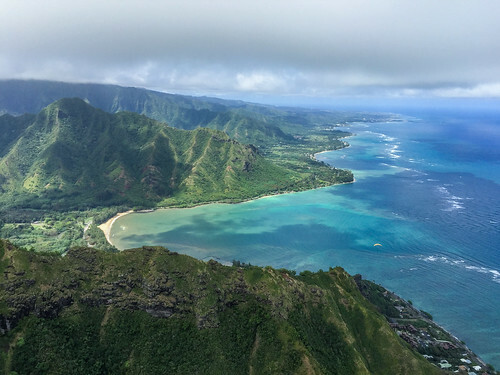 After Steve and I climbed up in the super north flow, we crossed the bay with the blessing of a crazy tailwind from Kahana, and then scoped out the north flow above Kaaawa and Kualoa. It was the northest air I’ve ever flown over there. It was almost flyable from the other side of the bay, at the northwest facing launch we call Anti-Kahana. Drew landed after a long session above Kahana. Steve and I were still up over Kaaawa when Thom arrived, and he hiked up only to find that it was definitely too north to get out of there, like 3 degrees. I flew back from Kaaawa to see how the backside of Kahana was working. Steve returned from Kaaawa and landed at Kahana, and I followed him in soon after. All three of us set up landings from the fish pond side; that’s how north it was. We were doing figure eights over the fish pond to lose altitude! Later, Maui Tim, Maui Justin, Gaza, and Portland Mark showed up, but they wanted to see what Thom would do before hiking up. When they heard he was hiking down, everyone pretty much gave up and left. But later I checked the numbers and of course it looked like it got better just after we all left. So on this day, only the early crew was rewarded for their stubbornness, with three hours of cross country flying in gorgeous crazy north conditions. Let’s hope for more of that tomorrow! I keep hearing how great our flying has been for the last few months actually last year or so. It is if you can chase the crap out of it. When I started flying, we flew every day with XC flights mixed in very frequently and not just hops across the pond, notable ones. When visitors used to ask what's the best time of year to come. I used to say we fly 364 days, gotta take one day off to rest. Now we seem to chase the heck out of every day. I mean we as the few that can, our weekend warriors are so dismayed that they don't even come out any more. Even chasing fly-aholics are getting windows slammed in there face. I hiked down or not even hiked at all, more now than ever before. Yes, I get to fly alot, so does Alex, Frank, Jorge, Doug and a few lucky others. But even the windows we are flying are marginal and for some too marginal. Desperation has started to seep into the good judgement bags and perhaps is another reason of more incidents. Some have even gone to the dark side of 'thumb twiddling rc planes'. Possibly a smart alternative for those of us that do not get to fly but once a month or in 6 months or a year for a few. Our weather has changed! With it the wind has got weirder. Alex, Steve and I had the most radical ripping thermal flight at KKC a week back. I got flipped over, cleaned my shorts and then kept flying cause maybe it would be the last dose for awhile. A normal person would have landed and kissed the ground. I guess what I am trying to say is when you show up to launch, look at your flight log, look who is in the air and ask about conditions. Use your heads please. If my pilot buddies loose a flight due to conditions and good judgement that's ok. But if I loose them to a crash from poor judgement, well that's just not ok. I took a nap at North launch this day, I have a nagging leg, the thought of hiking down was horrible, the memory of Jorge landing in the trees by the road due to NW conditions was even more horrible. I hiked down, it hurt but I'll get over it. It's Time to Fly, Get Your Head on Straight and Go!!! 'Or NOT' your call. I second that rant and call to good judgement! Actually, when I read all this winter's fantastic flying tales, I'm sorry I haven't been able to chase all the new crazy challenging flying that's been happening; but I'm still amazed at how different it's been compared to so many more consistent semi-predictable conditions in years past. I guess I should have read the prospectus before I got into flying "Past performance is not an indicator of future results." Unfortunately, the longer the amiable conditions stay at bay, the less able I am to take on the more tricky ones. Thanks Thom and Alex for the onsite reports this weekend. Thom, without your report (and continuous checking of weatherflow) we might have hiked up and disturbed your nap! Instead we got some honey-dos done to make more time for a future better w/e. And based on Alex's report for Saturday, we gave Makapu'u a long look instead, and opted out after watching 3 crazy launches from Crazyman's. This w/e, I'll click my heels 3 times and check the conditions ... and ?? ?